Richard Roberts has served as First Solo Concertmaster of the Montreal Symphony Orchestra since 1984, following his previous appointment as a concertmaster of the Cleveland Orchestra. He is a jurist for international violin competitions in Europe and America. During his illustrious career, he has presented masterclasses at l'Academie Internationale de France, Los Angeles Philharmonic Institute, the Meadowmount School, National Orchestra Institute, Northwestern University, Royal Conservatory of Music, and University of California at Los Angeles, and served on the faculties of the Cleveland Institute, Conservatoire de Musique du Quebec, McGill University, and Indiana University. In addition to his frequent performances as a soloist with the Montreal Symphony, Richard Roberts has been invited to appear as guest soloist with the orchestras of Cleveland, Detroit, Edmonton, Melbourne, Minneapolis, Toronto, and elsewhere around the globe. 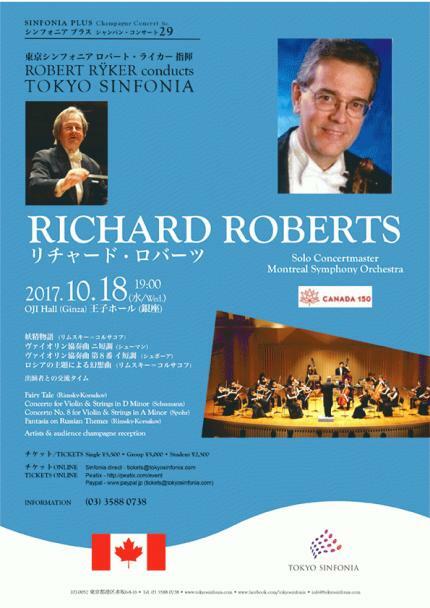 Richard Roberts' appearance with the Tokyo Sinfonia is supported by the Embassy of Canada as a part of the celebrations of the 150th year of the Confederation of Canada. Lauded as “the most exciting orchestra in Japan,” the Tokyo Sinfonia embodies the warmth and immediacy of Robert Rÿker’s affectionate approach to music. Personable, flexible, and delightfully creative, distinguished by rich sound, lively expression, and friendly rapport with the audience, the Tokyo Sinfonia has won much praise for the imaginative programming and inviting presentation of its hugely enjoyable events. Maestro Rÿker has appeared in over 2,000 performances in 50 cities on 3 continents, served as music director, principal conductor or musical advisor of more than 10 symphony orchestras and opera companies around the globe, founded orchestras in 3 nations, and conducted the Tokyo Sinfonia in over 150 concert programmes.